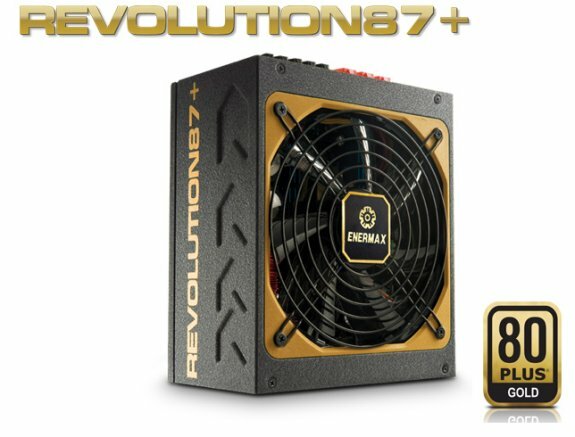 The successful Enermax Modu87+ has found a worthy successor: Revolution87+ continues the outstanding power supply series. It carries over the main advantages of its predecessor such as the forward-looking, highly efficient Dynamic Hybrid Transformer Topology or the leading fan speed control that ensures a silent operation. On the other hand, Revolution87+ profits by the technological progress of Enermax engineering. Partially, the new power supplies already follow the path-breaking technology of the Enermax flagship series Platimax ensuring an extremely high efficiency and rock stable voltages. Enermax engineers have refined the proved Dynamic Hybrid Transformer Topology of the Modu87+ series and come out with fabulous 87 to 93 percent efficiency at 20 to 100 percent load – beating even some Platinum models in the market. Revolution87+ has been tested by the international 80 PLUS® organisation and gained the 80 PLUS® Gold certificate. The new Enermax PSU also supports the most current ErP Lot 6 standard for computer systems with less than 0.5W power consumption in standby mode (PSU only). Like the Modu87+ power supplies, Revolution87+ is equipped with a durable 13.9cm Twister Bearing fan. The patented bearing technology guarantees a smooth and silent rotation with up to 100,000 hours MTBF lifetime. Enermax further relies on a smart RPM control that ensures an optimal balance between cooling performance and noise generation. With 300 or 500 RPM at low loads* and 1,000 or 1,200 RPM maximum*, Revolution87+ is an almost inaudible power source. Revolution87+ is based on a Multi-Rail design with up to four massive 12V rails. Each of them is equipped with a separated over-current protection (OCP). Enermax successfully improved its DC-to-DC technology to reach the best possible output voltage regulation and an extremely low ripple and noise. No doubt, Revolution87+ is the first choice to power advanced system configurations and latest gaming rigs, ensuring an ultra efficient, extremely silent and rock stable operation. There are 550W, 650W, 750W, 850W and 1000W editions, with prices ranging from around 160EUR to 270EUR.